Personally invite your attending Party guests to pucker up with exciting lip balm favors Here is a handy addition to anyone's purse or pocket. 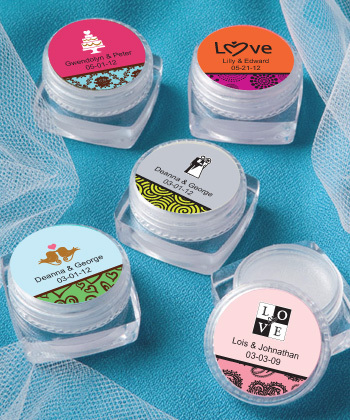 And this cute little lip balm favor gives you the unique opportunity to seal it with a personalized kiss - or label that is! Each 1.2 favor features a round container with luscious vanilla flavored lip balm inside, topped with a screw-on lid fit for easy application of the label of your choice. From assorted color combinations, to adorable themed designs that match your occasion, to your own title, you can personalize your label to make this favor a just for you memento of your special day. Sold bulk packaged, these lip balm favors are a true delight. Personalized labels are self-sticking for easy application.
. Please allow 3-4 days for production.